"That blast came from the Death Star! That thing's operational!" 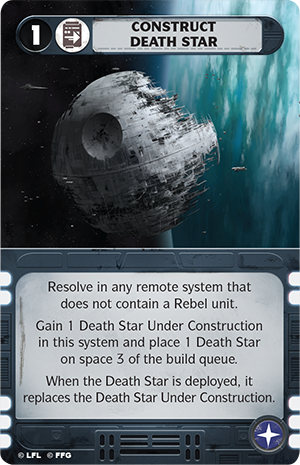 Star Wars™: Rebellion is nearly here, and it is coming fully armed and operational! If you had ever hoped to find the whole Galactic Civil War condensed into a single game and a single box, this is it. 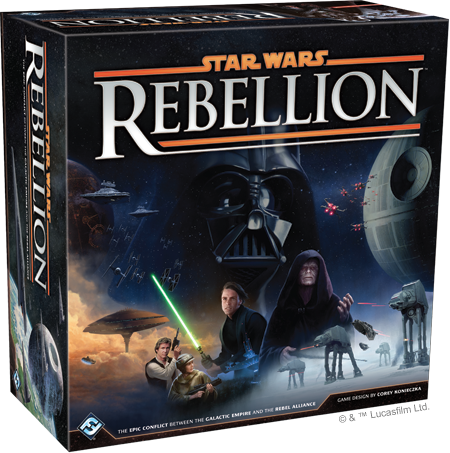 Star Wars: Rebellion is scheduled to arrive at retailers a week from Thursday, and when you pick up your copy, you can take command of either the entire Galactic Empire or the fledgling Rebel Alliance. 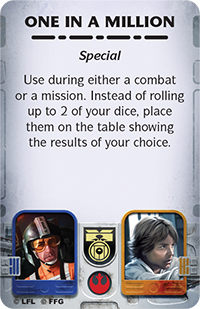 More than that, by picking up an early copy of Star Wars: Rebellion, you gain the opportunity to take part in the action of Rebellion: Week One. 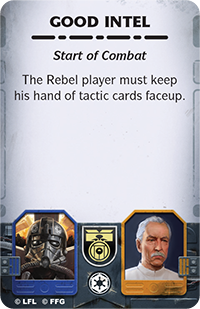 All week long, when you play your games, you can report your results and see how they help to shape the ongoing struggles between Imperial and Rebel forces. First, however, you will want to learn the game, and to that end, you can now download the rules! "Now witness the firepower of this fully armed and operational battle station." Star Wars: Rebellion is a big game. 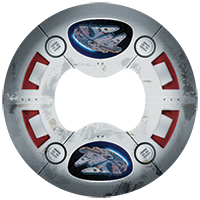 You have fleet battles, secret missions, and political gambits. You have two rival militaries vying for the hearts and minds of citizens throughout the galaxy and calling upon the resources of dozens of planets. You have Death Star Plans and Jedi training. You have probe droids scouring the galaxy to find the hidden Rebel base. Over the course of our previews, we saw how these many different concerns play out over the course of a game round. Although we also demonstrated how everything traces back to your leaders and their influence, the Galactic Civil War is still massive, and there is still a lot to absorb. 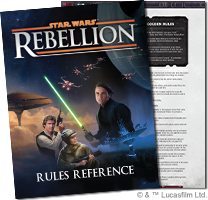 Accordingly, for your convenience, the rules for Star Wars: Rebellion have been divided into two separate rulebooks. 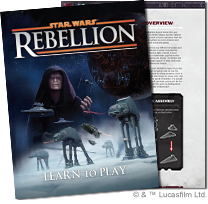 The Star Wars: Rebellion Learn to Play booklet (pdf, 17.2 MB) serves as your introduction to the game. It is intended to lead you quickly into and through your first battles. Once you download these documents, it is recommended that you read through the whole Learn to Play booklet before you play your first game, and then you may find it best to use the prescribed First Game Setup and save the advanced rules for a later session. 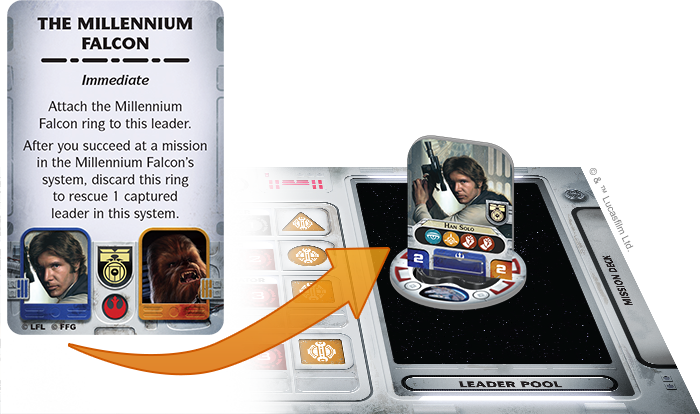 In this way, you can focus less on the additional rules and more on the heated conflicts at the heart of your battles for the fate of the galaxy! "The Force is with you, young Skywalker. But you are not a Jedi yet." Once you have played a few games and mastered the basic rules, you will likely appreciate the ways in which the game's rules and its flavor work together to weave deeply engaging play experiences, loaded with narrative drama. Some of these experiences may line up with the films; others may lead your Galactic Civil War in other directions. For example, you might discover the Rebel base on Hoth, only for the Rebels to fire their ion cannon and make their escape. Or you might witness Emperor Palpatine successfully luring Luke Skywalker to the dark side of the Force. Either way, you are almost certain to be swept up by the tension and the larger-than-life stories that all begin with your assignment of your leaders. The advanced rules outlined in the Learn to Play booklet carry these thrilling, narrative moments even further and lend further distinction to each of your heroes or villains. 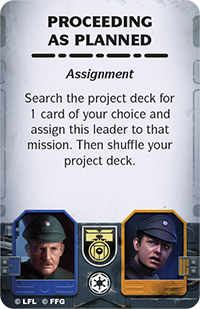 While the advanced setup challenges you to respond to the task of starting with different systems each game and permits you to make tactical decisions about the deployment of your units from the outset, the main adjustment in advanced play is the way that you handle action cards. You use action cards in the basic game, but only in order to recruit new leaders. Then, after you have recruited your leader, you remove the action cards that you drew from play, placing them back in the box. However, each of these cards also features an ability that you can use in advanced play. Instead of putting them back in the box, you hold onto them and can play them at the appropriate time. 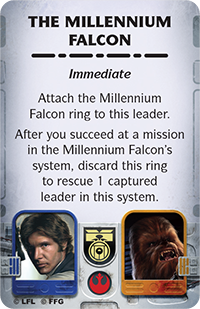 Accordingly, if you choose to recruit Han Solo with The Millennium Falcon card, you can immediately trigger the card's ability to attach the Millennium Falcon ring to Han, which provides him the ability to rescue a captured leader after he succeeds at a mission. Most action cards, however, do not give you attachment rings, and only a small percentage of them need to be played immediately. In fact, there are four triggers for when an action card can be used: Assignment, Start of Combat, Immediate, and Special. Assignment: The card is used during the Assignment Phase. Instead of assigning a leader to a mission, a player can flip the card faceup and resolve its ability. Notably, because your action cards only provide their benefits when used in conjunction with one of the leaders they depict, the action cards that you draw in the advanced game may very well end up influencing the leaders you recruit. For example, if the opportunity arises to recruit a new leader and you draw Good Intel and Proceeding as Planned , your first instinct may be to recruit Colonel Yularen for his three Intel icons, space tactic value of two, and ground tactic value of two. 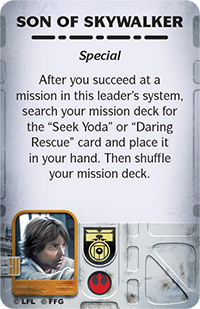 But recruiting either Yularen or Soontir Fel would leave you unable to target one of the leaders shown on Proceeding as Planned, meaning you would not be able to play it and would lose the ability it grants you to search the project deck for the Construct Death Star mission. 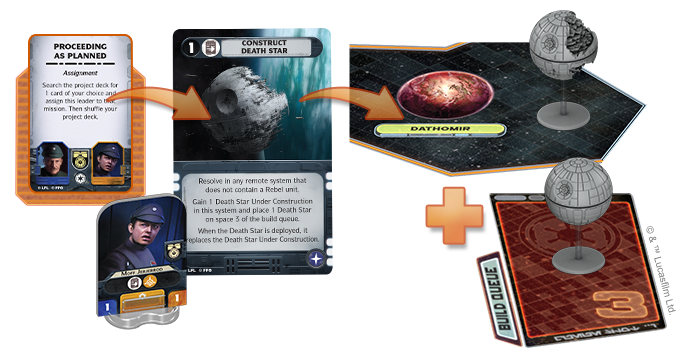 On the other hand, if you recruited Moff Jerjerrod, you could play Proceeding as Planned in the next activation phase to take the Construct Death Star mission into your hand, use it the next round to place the Death Star Under Construction miniature in a system of your choice, and begin building a second Death Star. 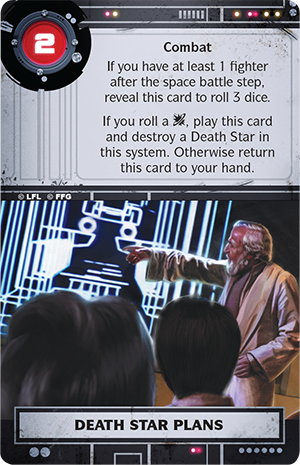 In the end, the use of the game's advanced rules and the addition of its action cards serve to further reinforce the thematic and cinematic aspects of Star Wars: Rebellion, even as they further enhance your leaders' uniquity and importance. After all, Luke Skywalker is not just a Rebel leader with three mission icons and two tactics in both space and ground battles; he is the Son of Skywalker who can Seek Yoda to receive his Jedi training, and he is the Rebel ace who struck a One in a Million blow against the Galactic Empire by firing the shot that exploded the Death Star . In the advanced game, these elements make an even greater impression, even as your action cards provide you even more tactical options and sneaky ways to disrupt your opponent's best laid plans. Play Your Part in Rebellion: Week One! The Galactic Empire needs you! So does the Rebel Alliance! 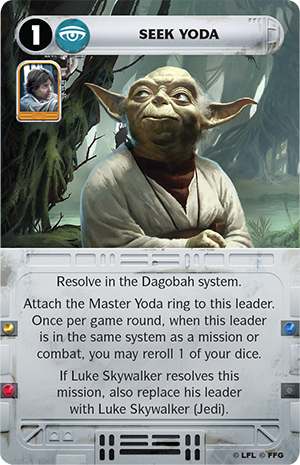 Star Wars: Rebellion is scheduled to arrive at retailers next Thursday, and we invite you to celebrate the first shots in the Galactic Civil War by jumping in, playing with your friends, and reporting your results. From Thursday through Monday April 10th, we will collect your results and add them to our constantly changing heat map. See which areas have fallen under Rebel control. See where the Empire has asserted its might and established order. 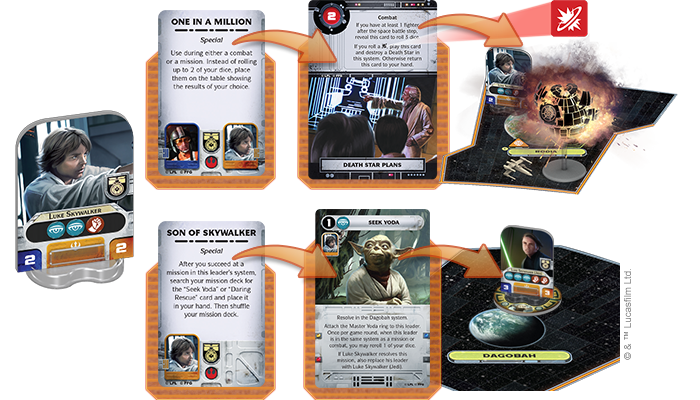 Over the course of Rebellion: Week One, we want you to be a part of the greatest board game battles in the history of the Star Wars galaxy, and at the end, we plan to report which leaders and which missions saw the greatest success, as well as how many planets the Death Star manages to destroy. We also want to share some of your favorite moments, so be sure to report the most exciting and fateful moments from your games. How will the galaxy come to life on your tables? We want to know. So get ready! Thursday the 31st, the Rebellion begins!